Chicken, and Spinach, and Pesto! Oh My! | Hapa...Shot the Food! Chicken, and Spinach, and Pesto! Oh My! 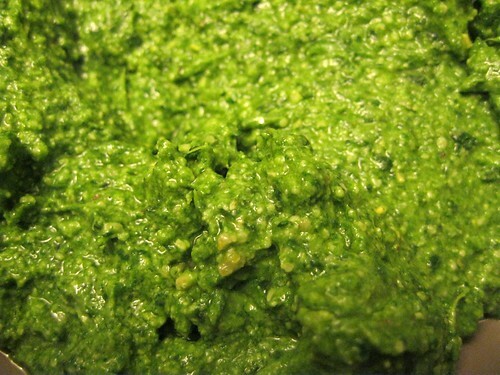 Another thing I like about the recipes I’ve run into with chicken, pesto, and spinach as ingredients are that they are relatively easy to make…especially if you go the semi-homemade route with the pesto. Heat 2 teaspoons oil in a large saucepan or Dutch oven over medium-high heat. Add carrot (or bell pepper) and chicken; cook, turning the chicken and stirring frequently, until the chicken begins to brown, about 3 to 4 minutes. Add garlic and cook, stirring, for 1 minute more. 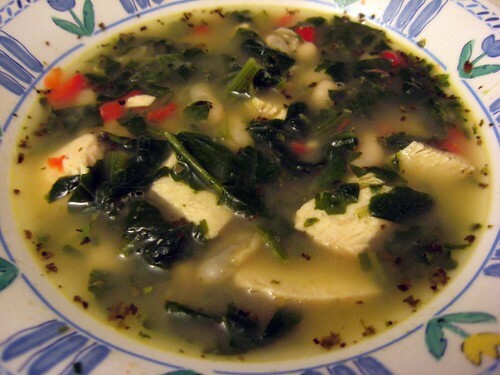 Stir in broth and marjoram; bring to a boil over high heat. 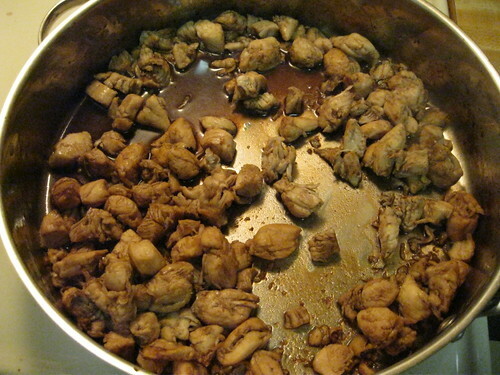 Reduce the heat and simmer, stirring occasionally, until the chicken is cooked through, about 5 minutes. Transfer the chicken pieces to a clean cutting board to cool. Add spinach and beans to the pot and bring to a gentle boil. Cook for 5 minutes to blend the flavors. 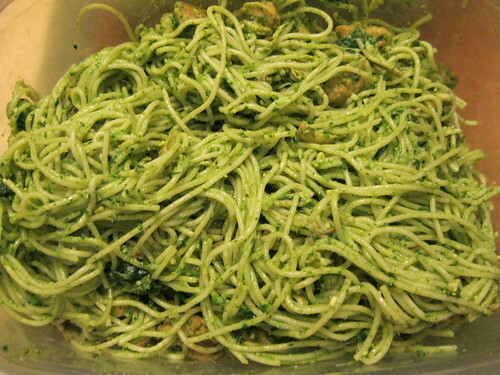 Combine the remaining 1 tablespoon oil, Parmesan and basil in a food processor (a mini processor works well). Process until a coarse paste forms, adding a little water and scraping down the sides as needed. 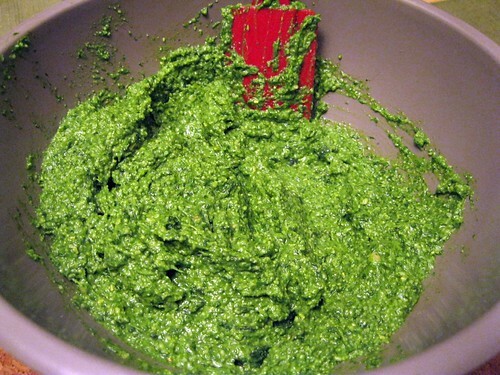 Putting spinach *in* your pesto makes for a very bright-colored pesto (as well as much yumminess). 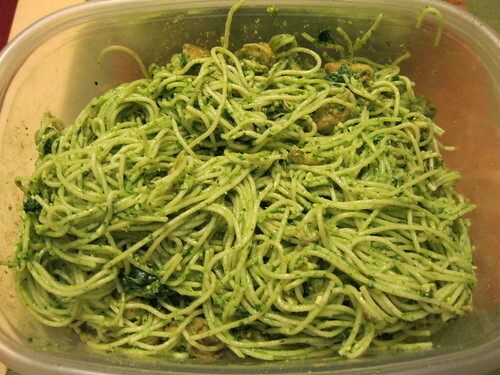 Earlier this week, I made this recipe combining pasta, chicken breast tenders, and spinach pesto. I don’t use mint and I put grated Parmesan cheese in instead. I put the pine nuts in my blender first (I don’t have a food processor yet) then put in the basil, garlic, cheese and spinach. I added olive oil, then used the “chop” function of my blender, adding more oil until I got the the consistency I wanted. For the chicken, I wanted to add an extra layer of flavor. After cutting a pack of chicken breast tenders (between 1 and 1.5 lbs worth) into cubes, I cooked them in balsalmic vinegar and brown sugar. I also not didn’t measure the vinegar or the sugar (just put enough to be “to taste”). The chicken took on a little bit of the flavor of the balsamic vinegar and brown sugar mix…just enough to make their presence known, but not clashing with the other flavors. 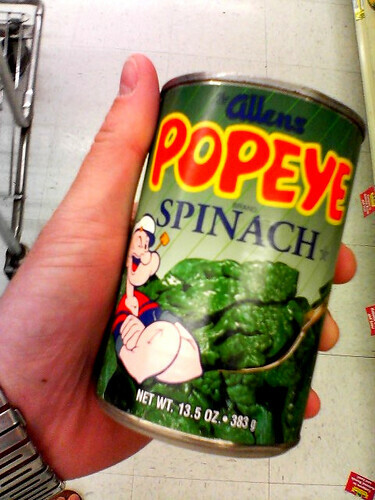 Posted on August 5, 2010, in Uncategorized and tagged chicken, pasta, pesto, soup, spinach. Bookmark the permalink. Leave a comment.